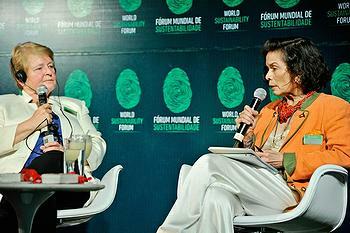 MANAUS, Brazil, March 26, 2012 (ENS) – Social and environmental activist Bianca Jagger linked the issues of sustainable development and human rights at the Third Global Sustainability Forum that concluded today in Manaus. Some 900 leaders of business, political, social and environmental organizations met over the weekend to exchange management experiences at the forum. They focused on creating a green economy and sustainable development in advance of the United Nations conference on sustainability slated for June, known as Rio+20. 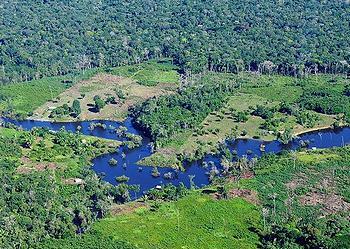 Jagger said the Amazon rainforest is “an extraordinary treasure, home to many species,” and mourned that a great many square kilometers of the Amazon rainforest already have been lost to development. “We cannot sacrifice present and future generations in the name of development,” said Jagger expressing her support for investment in sustainable energy. Chief Almir Narayamoga Surui, chief of the Gamebey Clan of the Surui people in the Brazilian state of Rondonia, told forum participants “public and private policies do not reach the communities they are supposed to reach” and called upon business leaders to help create a green development model for Amazonia. 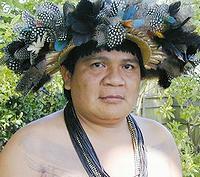 In October 2011, the chief earned the first Bianca Jagger Human Rights Foundation Award for Leadership in recognition of “his courageous struggle” in defense of Surui ancestral land in the Amazon and his commitment to environmental protection and to the survival of his people. Chief Almir is a pioneer, who has led the Surui with great wisdom and courage, says Jagger. In 2009 he forged a relationship with Google, who provided the Surui with smartphones, from which photos and videos are geo-tagged, and uploaded to Google Earth. The tribe used the phones to create a cultural history with stories from the tribe’s elders on YouTube, and also to record environmental abuses and illegal logging on their land, to show the world what was happening. “There’s a price on my head,” says Chief Almir. “Somewhere in the forest, someone is planning an ambush.” Regardless, the chief maintains that the Surui people are the best custodians of their land. “Illegal deforestation – carried out by loggers, ranchers, miners and intruders on indigenous territories, destroys the forest trees, kills birds by destroying their nests, kills animals that live off the fruits that grow there, and threatens indigenous peoples that live in forests and depend upon them. My people, the Surui Paiter, are living proof of what I say. We have long suffered the wrongful acts of loggers that steal our forests and threaten to kill our leaders,” the chief said. The Third Global Sustainability Forum was sponsored by the Brazilian group LIDE, Grupo de Lideres Empresariais, or Group of Business Leaders. At the closing ceremony today, LIDE officials signed a commitment to work towards Brazilian legislation that ensures sustainable development. LIDE President Joao Doria Jr. read the Amazon Charter, in which LIDE formalized its commitment to mobilize Brazilian society to pass a national law that establishes payments for environmental services, recognizing this mechanism as essential for ensuring sustainable development. Brundtland has served three terms as Prime Minister of Norway. A physician, she has served as the director general of the World Health Organization and now is a Special Envoy on Climate Change for the United Nations. From 1983-1987, Dr. Brundtland chaired the World Commission on Environment and Development, developing the political concept of sustainable development during extensive public hearings. The commission’s 1987 report, “Our Common Future,” provided the momentum for the landmark 1992 Earth Summit in Rio de Janeiro, Brazil. Twenty years later, the Rio+20 conference will take stock of progress and negotiate towards a green global economy. In Manaus, Brundtland pointed out the urgent need for investments in sustainable technologies and cleaner energy to improve inequalities. “In 2030, the world will need 50 percent more food, more energy 40 percent and 30 percent more water,” she said. “Not only politicians and governors, but we all need to grow and share the responsibilities,” she said, advocating public-private partnerships to improve global governance. 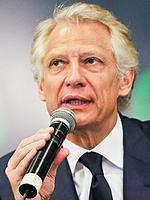 At the Manaus forum, former French Prime Minister Dominique Villepin (2005-2007) underscored Brazil’s leadership role in issues of the environment and sustainability. “You are the country of the possible, and Amazonia can become a model of sustainable development to create economic opportunities,” Villepin said. He praised Brazil’s creation of national parks and advocated regional partnerships between Brazil and Europe. Villepin said decisions on sustainable development are, to a great extent, in the hands of emerging countries, and that they must choose between confrontation and cooperation; between leadership and imitation. Virgilio Viana, general superintendent of the Sustainable Amazon Foundation said the challenge is to stop the deforestation of Amazonia. Greenpeace Executive Director Kumi Naidoo spoke about the responsibility companies bear for their environmental footprint. He made an appeal to businessmen and Brazilian government officials to act together with environmentalists on solutions that make possible both sustainable development and economic growth that fosters job opportunities for everyone. From a completely different perspective, mountain climber, fashion designer and businessman Oskar Metsavaht, founder and president of the sportswear label Osklen, told the Global Sustainability Forum that all the people of Brazil need to improve their lives. “Brazil needs to develop economically, and it has vast space to become a developed country with a fair distribution of income in a sustainable manner,” said Metsavaht. To Metsavaht, one obstacle is the lack of a branding plan. “Unless we have added value, we’ll just continue to be commodity vendors, just talking about charity. We must show that it is more interesting to buy sustainable products from Brazil than famous brands from the United States, made with cheap labor from China,” he said. Former Brazilian Minister of Agriculture Roberto Rodrigues (2003-2006) spoke about “prospects for low carbon agriculture in Brazil.” Rodrigues serves on the Council of Advisors to the World Food Prize and as co-chairman of the Interamerican Ethanol Commission and the International Biofuels Commission. He emphasized the initiatives of academe, particularly the Embrapa, or the Brazilian Agricultural Research Institute, to improve the productivity of Brazilian agriculture with good environmental practices.